A cow skin rug is as it sounds; a rug made from the skin of a cow. The rug is generally organically shaped, the size of the largest attainable piece of fur, and can be any color from brown to rich rust to the most common, white with black or brown spots. Buying a cow skin rug can be both expensive and difficult to find, and animal lovers will have a diffucult time with the idea in general. 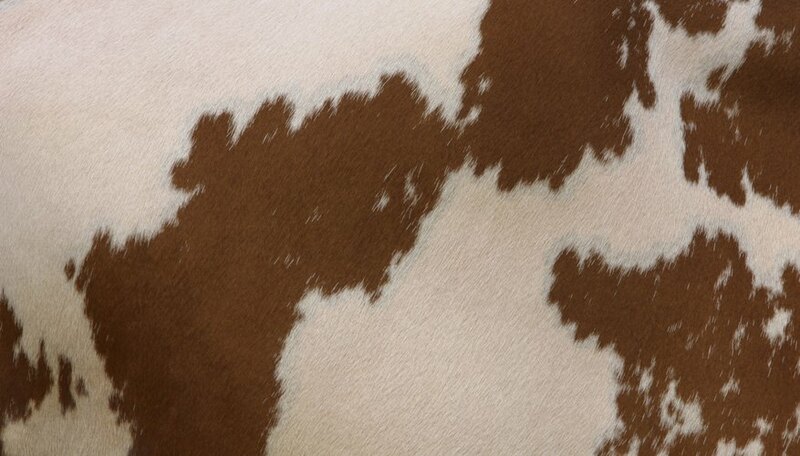 Create your own cow skin rug using faux suede and fabric paint, the cheapest and simplest way to accomplish the project. Lay the microfiber on a clean floor or another flat large surface. Draw a rough outline of an animal hide using the pencil. Draw an uneven oval shape at the top edge of the fabric, two jagged, uneven rounded regtangular shapes for front legs, and two more for back legs underneath. Connect the oval shape to the legs and the legs to each other with jagged curved acute lines. Create another short jagged regtangular shape for the back side of the cow at the bottom of the fabric. The shape should be longer than it is wide and should extend the length of the fabric. Cut out your shape on the pencil line using the scissors. Squeeze the paint onto your pallete or paper plate. Dip the brush in the paint and create splotchy, uneven spots on the shape. Space them unevenly, creating big spots in some areas and small ones in others. Apply the paint densely, making sure it penetrates to the bottom layer of the face of the fabric. Allow the paint to dry. Heather Berkowe is a fashion designer with a Bachelor of Fine Arts in fashion design. She has more than five years of experience in the fashion industry, including design work for lingerie brands and owning the inner-wear company Soussuits. Berkowe has been writing since 1997, with work appearing in the "Journal News" and Metropolitan Museum of Art exhibitions. What Is a Jute Rug?